Pizza Puffs. Pizza Bites. Whatever you want to call it. 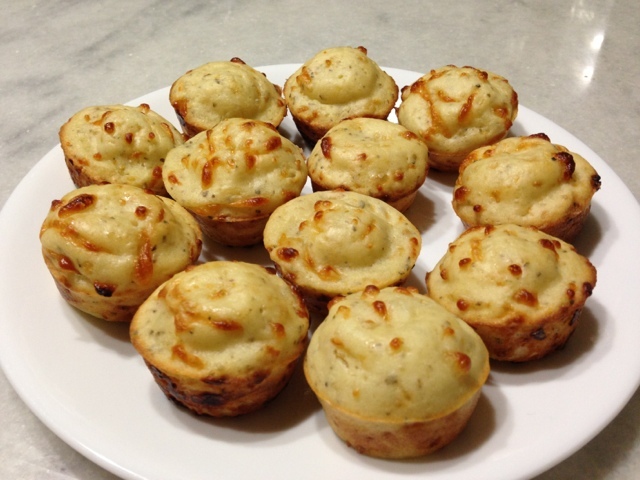 These Pizza Puffs are a great finger-food snack, or would be great as an appetizer for a party. Preheat your oven to 375 degrees. Spray non-stick cooking spray throughout your [non-stick] mini-muffin pan. I sprayed my non-stick pan just to be absolutely sure that they’d come out without a problem. In a bowl, mix together your flour and baking powder. Next, add in the milk and egg. Stir to combine everything. Mix in your shredded mozzarella cheese, the oregano, basil, and garlic powder. This would also be where you would mix in your pizza toppings of choice, whether it be vegetables like mushrooms/peppers, or chicken/meat. Pour the batter, evenly, into the muffin pan, filling it about 2/3rds of the way full. They will rise! Bake in your preheated oven for about 25 minutes, until they are light golden brown on top. Note: You will probably end up with enough batter for two batches [for a 24-cup mini-muffin pan]: repeat with second batch! Serve pizza puffs warm with warm marinara sauce for dipping. P.S. This post is a part of my “What’s for Dinner” series, where I share what I’ve been cooking and my recipes. These look great! Can&#39;t wait to try these with my kids, thanks for sharing! Thanks Christi! You and your kids will love it! Yummy! These sound like a great snack! Visiting from TT&amp;J Weekend Wrap Up. These look yummy. I like anything pizza related. Thanks for sharing! Thanks Jeni and Megan! They were a great snack. I found them to be the best served right out of the oven. I made these for dinner last night! They didn&#39;t turn out as pretty as yours, but they were tasty! Glad you tried them out [and you liked the taste!]. Appearance wise, what went wrong? Then which of the favors of your Lord will you deny?